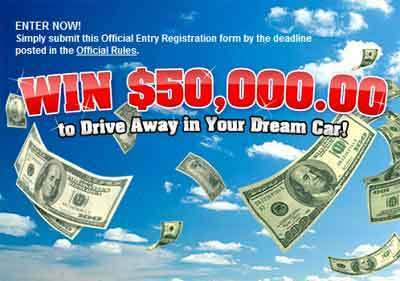 www.PCH.com – Publishers Clearing House Win $50,000.00 to Drive Away in your Dream Car. What is your dream car? Is it a Sedan, SUV, coupe, convertible car or sport car, Whatever your dream car is, this PCH cash prize could help you buying it. In my case, I always dreamed of driving a car with character as the very expensive ferrari 250 gto 1964, but this car is way over my budget. lol. Back to PCH new car sweepstakes. If you want to enter the PCH Giveaway No. 2764 No.3726 for a chance to win a cash prize to buy your dream car, visit today www.pch.com and follow the on-screen instructions to enter the promotion. Giveaway No. 3726. Publishers Clearing House Car Sweepstakes! Enter For Free. You don’t have to buy anything to enter. No purchase necessary. Just follow the instructions in the PCH.com Sweeps Official Rules. All entries received by February 20, 2017 from the PCH Bulletin will be eligible for a $50,000.00 prize (Giveaway No. 3726). You will automatically be entered into this Giveaway by completing and submitting the sweepstakes entry form. All entries received by 11:59 P.M., ET, 2/20/14 from this Promotion will be eligible for a $50,000.00 prize (Giveaway No. 3726).Good luck! Prizes will be paid in full by check at time of award, unless otherwise noted. All entries received by 11:59 P.M., ET, 2/20/14 from this Promotion will be eligible for a $50,000.00 prize (Giveaway No. 3726). I am trying to get a brand New Ford Fusion – Could luck come my way. I do not have a car at this time and sure am in need. For more than 6 months, non-stop, thanks to Publishers Clearing House, I have been striving to claim my eligibility for daily entry into the amazing sweepstakes opportunity ,thru’ the profoundly efficient PCH search engines, offered to any contestant for a chance to win jackpot cash prizes which include $50,000 from Gwy 4650 toward my dream car: possibly F-150. Would love to win the prize cash of $50,000.00 for a new car. I need this $50.000.00 badly Publishers Clearing House for improvements to my house which I am hoping will be a possibility. I would like you to activate 2 entries for $50,000.00 for a new Car , pch gwy. no. 4650. Thank you. I would like you to activate 2 entries for $50,000.00 for Home Improvements, pch gwy. no. 4650. I am searching from FrontPage looking to make 2 entries for $50,000.00 for Home Improvements, pch gwy. no. 4650, plus, I would like to make an “special early look” for $7,000.00 a week for my life, pch gwy. no. 4900, for October 23rd. YES PCH I just enter for the 50,000.00 dream car gwy no 4650 oboy do I want and need to win it! Ok, I want to win 50,000.00 for my dream car Giveaway 4650 Iam very interested in winning ,plus 7k a wk forever is my big dream. I Ioveyou pch! Ok, I want to win 50,000.00 for my dream car Giveaway 4650 Iam very interested in winning ,plus 7k a wk forever is my big dream Ioveyou pch! PCH win $5O,OOO.OO Cash For Home Renovations from PCH Gwy. No. 465O! Plus $7000 a week for life with PCH Gwy. no. 4900. Thank you for this opportunity. Plus I would love to win an Exclusive $1O,OOO.OO PCHGames Cash Prize (Gwy. No. 5323). Again thank you. I am here to reply to a email about wining $50,000.00 cash. Oh yes I want in on thus one, I am in it to win it so lets get winning. Oh this could make an old woman happy. I could buy my own home. Not a large place but a place I can call my own. Please allow an old woman to be happy, happy, happy!!!! Please except this as my entry and activate my winning number to win the $50,000.00 cash. For this I am thankful. I want to win 50,000.00 for dream home. Giveaway 4650 and do my entry for 7k a wk forever in October 23 Giveaway 4900 I want to win this time. I loveryou. Pch! I would’ve to win $50,000.00 toward Home Improvements, husband not to handy in that field, ha,ha, pch gwy. no. 4650, plus I could handle winning $7,000.00 a week for my lifetime, (pch gwy. no. 4900.00. Publishers Clearing House please verify my entries for October 23rd. Thank you. Need the Home improvement GWY #3726. Yes I Ee Lee want to entered win $50,000.00 cash on October 23 gwy No.4650. Thank you Jesus. Amen. I COULD LIKE TO WIN 50,000 IF IT IS WELL IN NAME JESUS AMEN. PCH MY family and my future wife need that 50,000.00. MY DREAM CAR NEEDS TO BECOME A REALITY. I KEEP PRAYING FOR A NEWER CAR. MY 16 YEAR OLD FORD TAURUS WAS HIT BY A SNOW PLOW LAST WINTER. MY INSURANCE COMPANY COULD NOT HELP ME OUT. THEY WANTED TO TOTAL IT AND TOW IT AWAY. I AM BEING THANKFUL FOR MY DREAM CAR. GOD BLESS AND HAVE A GREAT DAY! PCH win a Brand New Car Ford Fusion from PCH Gwy. No. 465O? PCH $7,000.00 a week for life Gwy. No. 4900! Hope to win all my numbers including the Ford Escape, Ford F150, Dream Home, $1 Million, and a great vacation! Hope to see the Prize Patrol and the Reno TV crew on Oct. 23rd! Thanks PCH! I am very very interested in winning $50,000.00 for my dream car, i know exactly what i want to own and drive,therefore it is really exciting to win this prize! I would like to get that $50,000.0 Gwy. No. 4650. God’s Blessings. PCH $3,OOO,OOO.OO for a Dream Home 4900! PCH win $1O,OOO.OO Cash from PCH Giveaway No. 5326! Can’t wait to see the Prize Patrol on Sept. 8th along with the Reno TV crew! Hope I get all the prizes from my numbers and the Ford Fusion, Ford Escape, Ford F150, Dream Home, 1 Million and Vacation etc! Thanks PCH! I really want to win $50,000.00 for my dream car, it is a lot of fun to look for own car, and it could tell a lot about your personality by what you drive. Thank you for this opportunity! I am very much ready to win this great gift! PCH SweepStakes/SweepStakes Entries! From PCH GWY.NO. 4651/4902/4749! Dream Car Drive My Way Plus Love Have A $25,000.00 Bonus Cash Prize Sitting In That $50K Dream Car Please PCH Prize Patrol Show Me D.M. From FLA Dreams Can Come True. I AM LOOKING FORWARD TO WINNING MY NEW DREAM CAR. I would love to win the 50,000.00 for my dream car !!! I AM DREAMING OF WINNING MY DREAM CAR.I KEEP PRAYING TO WIN. THANKS PCH. I AM BEING GRATEFUL. PCH win a Brand New Ford Fusion from PCH Gwy. No. 465O – A $38,73O.OO Value! PCH win $5,000.00 a week for life “Forever” Gwy. No. 4900! Hope to see the Prize Patrol and the Reno TV crew at my house in NV on Aug.31st! Hope to also get all the prizes from all my numbers and the Ford Fusion, Ford Escape, Ford F150 and my Dream Home and all the other cash and prizes! PCH SweepStakes/SweepStakes Entries! From PCH GWY.NO’S. 4651/4902! PCH A Brand New Dream Car Could Help Me Push My Limits To The Sky & Back Plus $25,000.00 Bonus Cash A Little Pocket Change To Shop With Is Nice Ty Please Accept My Entries God Bless D.M. FLA.
Hi there Pch Staff Prize Patrol I Ee Lee search today that yesss they will be coming to 2502 W. Mitchell St to deliver a huge prize on August 31 gwy No. 4900. Thanks. I truly want to win A Brand New Car Worth $50,000.00 from PCH GWY.No.4650! I really want to win this prize. Hello PCH!. I love it. When it is my turn to win, i will be so happy. I pray to God i will win. Sometimes i say it is my turn and when i don’t, i am disappointed with myself. There are times tears come to my eyes, and when others win, i am happy for them. Our home is small, one bath room. I have lot of medical problems. Thanks for happy times. Looking forward to PCH winnings of a New Car or Cash. I’M CLAIMING PCH.COM PUBLISHER CLEARING HOUSE WIN $ 50,000.00 DREAM CAR. PLUS I’M CLAIMING PCH WIN A BRAND NEW FORD FUSION WORTH OVER $ 38,000.00. PLS ENTER MY ENTRIES, THNX PAULINE. .. Yes PCH I want to win along with the other million people $50,000.00 GWY 4650! Thank You for the offer!! I Robbin Perry want to claim the Ford Fusion Car I hope pch prizes patrol comes knocking on my door. From pch gwy. No. 4650 & claiming the 5k a week”forever” from pch gwy. No 4900. I AM READY TO WIN WIN WIN WIN!!!!!!!!!! I want ten Chances to win $50,000.00 for a dream car from PCH Gwy.No.4650! It is really great have ten chances to go for, very encouraging!! Awesome! I believe in miracles and my wish to win will come true. I want to win the $50,000 for my bills and so I can move to a better place to live. PCH Thank You for giving me the opportunity to enter for the $50,000.00 GWY 4650. I sure do need New car!! Yes I would like to win that $50,000.00 for a dream car Number 4650!! Hey yes I Ms. Lee want to win the $50,000.00 bonus cash gwy No.4902. And plus I also want to win yes Wisconsin forever prize on August 31 gwy No.4900. By the way, thanks….. Loves. PCH Brand New Stylish Ford Fusion valued at over $38,OOO.OO from PCH Gwy. No. 465O! Hope I get it and “WIN IT ALL” $2 Million + $10,000.00 a month for life + Lincoln MKZ Gwy. No. 4900! Hope to see the Prize Patrol and the Reno TV crew at my house on June 30th and get the $1,000 Gwy. No. 5035! Also hope to get all the prizes for all my numbers! Thanks PCH! I Ee Lee would loves to win a brand new ford fusion on June 30 gwy No.4900. And plus please help me activate $2 Million superprize and $10 thousand a Month.thanks… Love. I Ee Lee here just because I do loves to win too okay on June 30 gwy No.4650, and plus gwy No.4900 too. And, I do have dream that I can’t never ever make it happened because its very hard for me to make it happens cause, I don’t even know how to make it happens at all and it just so hard to reached it to my dream so. And, I really don’t what to without your all helps until now but just let’s see only. Cause, I do have a feeling all the times long time that I’m alone and lived alone in this world.Well, thanks a lot very much for your love. I Ee Lee here cause I do want loves to win a new car on June 30 with the gwy No.4650. Please, so I won’t to take the bus all the times like this to me cause it confused me every day with the scheduled when I taken the bus. But, then thanks a lot very much those… Lovely peoples. PCH! PATROL ELITE TEAM! YES PLEASE I WOULD LIKE TO WIN A MILLION AIRE DREAM COME TRUE! PLUS “WIN IT ALL!”PLUS MORE, 10,000.00 A MONTH FOR LIFE, PLUS BRAND NEW CAR LINCOLN MKZ! ON JUNE 30TH!. PLUS LIKE TO WIN $50,000.00 DREAM CAR# 3727 , GUY NO.4650, GWYNO.4900. I WOULD BE AN HUGE HONOR TO WIN A BRAND NEW FORD FUSION. IT’S A GOOD ECONOMY CAR. MY KIDS AND I WILL ENJOYED IT DRIVING,FOR SCHOOL AND WORK. THANK YOU SO MUCH PCH FOR THE HUGE OPPORTUNITY. PLEASE APPROVED AND CONFIRMED ALL MY ENTRIES PLEASE KINDLY THANK YOU. IT’S BECAUSE I REALLY NEED A CAR MY CAR BROKE DOWN NOW AND I CANNOT AFFORD TO BUY ONE. THAT’S WHY I ENTER EVERYDAY. HOPING I COULD WIN ME ONE ON GOD MERCY I REALLY COULD WIN ME ONE. I SURE I COULD USE A CAR FOR WORK AND FOR SCHOOL TOO FOR MY CHILDREN THEY GO TO SCHOOL EVERYDAY. THANK YOU PCH PLEASE MAKE MY DREAM COMES TRUE PRETTY KINDLY PLEASE!!! MAY GOD LORD BLESSINGA BE WITH YOU ALL! I would love to win the dream car of 50,0000. I also like the Lincoln too. Any of these winning would be a blessing. I AM IN IT TO WIN IT ALL AT PCH……. WHERE ARE YOU PRIZE PATROL??? I WANT MTO WIN THE 50,000.00 FOR A DREAM CAR, 3 MILLION FOR MY DREAM HOME, 2 MILLION PLUS TEN THOUSAND A MONTH FOR LIFE– AND THE BRAND NEW LINCOLN. OH, HOW I HAVE BEEN TRYING EVERYTHING I CAN TO WIN THESE. I HAVE GOT TO WIN IT IS A MUST. I DON’T WANT TO BE LET DOWN. I WANT TO WIN IT ALL. PLEASE COME TO MY HOUSE DANIELLE LAM, DAVE SAYER, AND TODD SLOANE. PCH.COM – PUBLISHER CLEARING – ”PLEASE” DONT FORGET TO COME MY WAY I WANNA WIN TOO .JUST ONE BIG NICE ONE . PUBLSHERS CLEARING HOUSE WIN $50,000.00 TO DRIVE AWAY IN YOUR DREAM CAR # 3726 , BEAUIFUL Red Car I be happy to entry in this sweepstakes to win a car. I would love to win the dream car for my eldest son, who has been helping me so much of my welfare. I couldn’t ask for a better son. He really deserve something good to him. Since my eldest son is so loving, helping me monthly for part of my rent, I know he’s tight with his financial. It would be wonderful to win this car for him, since he has an old car right now. It would be a miracle blessing to win this car because my eldest son has been so loving to me. Knowing that I’m living in a senior housing and still my expense is very limited. He offer to help with part of my rent and yet he is very tight with his own expense. I would like to win this car for him to show my appreciation of his good heart. I know he himself needed financial help also. It would be a miracle blessing if it materialize. PCH. COM -PUBLISHERS CLEARING HOUSE WIN $50,000 DREAM CAR .I WOULD PICK A NEW CAR HAPPY WITH JOY ‘YES’ WANNA WIN. I’m looking forward for the biggest surprise of my life. Yes, to win the PCH biggest prize. I’ll will be so bless if it happens. PCH.COM- PULBISHER CLEARING HOUSE WIN $50,000.00 DREAM CAR # 3726 IT’S BE HONOR TO WN A BRAND NEW CAR. I AM ENTERING TO WIN THE FIFTY THOUSAND DOLLAR DREAM CAR. yes PCH i want and need to win this 50,000.00 dream car and i also want to week the brand new ford fusion gwy no 4650 YES! I am always in it to win it! I would love to win and help my parents fix their home. I hope to help the homeless also. Hi, my name is Cynthia and I really wish I could win something. I live in Sun City,Arizona. I am taking care of an elderly 79 year old lady who is disabled and has suffered 9 strokes.I have a huge responsibility. I live with her and her husband. Cooking, clean house,laundry etc………! I stay in there laundry room and kinda made it into a mini studio for myself and my little dog. I work 10 1\2 hours a day 6 days a week.IF GOD CAN ANSWER MY PRAYERS, I AND IF I WIN, I WOULD BUY A BIG HOUSE AND TAKE CARE OF THE PETERSON COUPLE GIVE THEM THERE SPECIAL NEEDS. THIS WOULD COMPLETE MY LIFE AND HAPPINESS FOREVER.THANK YOU PUBLISHER CLEARING HOUSE. I want to win the GWY No. 4900. I want to win it all. PCH.COM PUBLISHERS CLEARING HOME WIN NO.3726 $50,000.00 DREAM CAR .A PRETTY RED CAR WOULD LOOK NICE IN MY DRIVE WAY . OK, I am ready to win the dream car, the GWY. NO. 4900, the dream home, the ten million, the one million all of these are the right ones for me !!! COME TO MY HOUSE PCH WITH THE BIG CHECK…. THANK YOU !!! I WANT TO ENTER FOR THE FORD FUSION, THE LINCOLN, THE 3 MILLION FOR THE DREAM HOME, 7,OOO.OO A WEEK FOR LIFE COMING UP THIS aPRIL 30TH, AND THE NEW ONE COMING UP….WIN2 MILLION A YEAR FOR LIFE PLUS, THE CAR, AND TEN THOUSAND AT THAT. PLEASE, PCH COME TO MY HOUSE……. I want to win the dream car# 4650. Driving in style !!!! I hope and pray one day to be a grand prize winner of the $50,000 car along with the other prizes. PCH SweepStakes-SuperPrize Entries! PCH/WIN A Brand New Ford Fusion Plus $7,000.00 A Week For Life SuperPrize! From PCH-GWY’S.4650/4900! D.M.